Radioactive sources are most often measured while placed in containers. It is important to specify the container holding the source, since it represents an absorbing layer and, thus, attenuates the gamma-rays on their way to the detector. In Angle you can define an unlimited number of containers. If the source is not in a container (e.g. stand-alone pill sources), then the container data does not have to be entered. 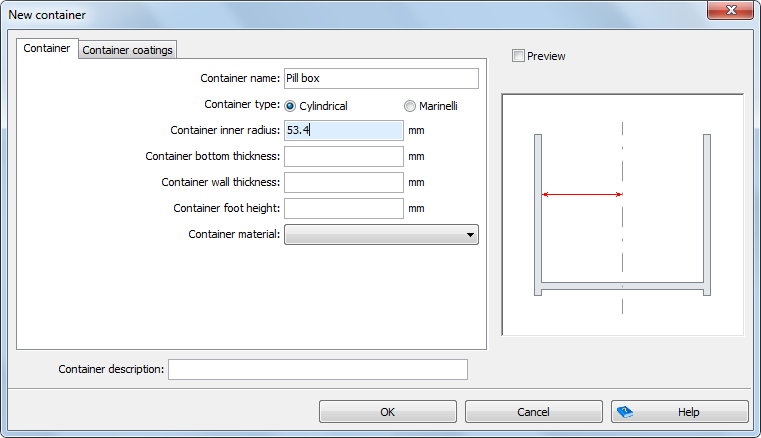 Instead, simply choose the option “No container” in the “Container” box on the main screen. All your containers will be displayed in an alphabetically sorted list. 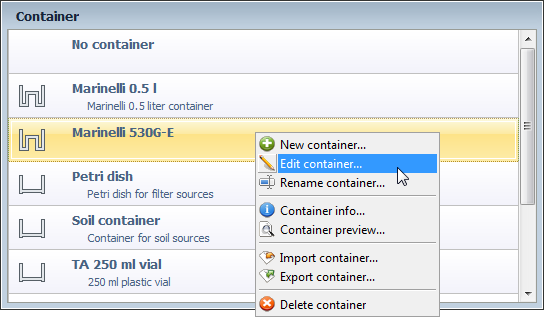 The options for container manipulation are located in the “Container” tab on the ribbon. The alternative method is to use the pop-up menu with the same options, which you can open by right-clicking the list of containers. 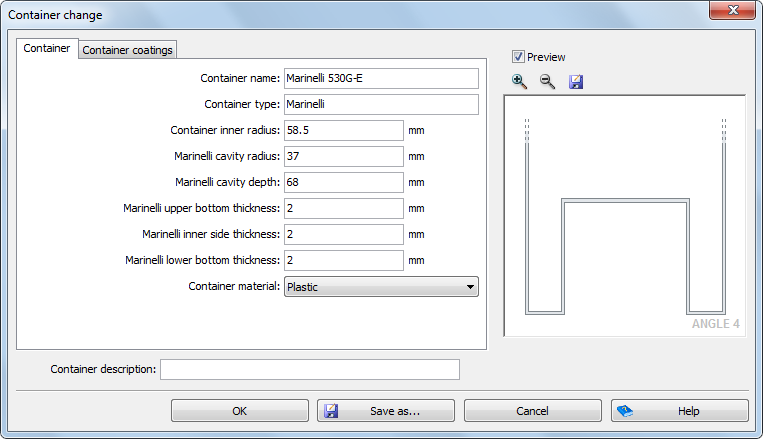 Depending on the container type, its parameters will vary. The next figure shows the container data entry window, with the preview image on the right-hand side and the dimension line indicating the parameter being edited (container inner radius). The first tab contains the information about the container itself, while the second tab contains the information about the inner coating layers. Up to two coating layers are supported. Each coating layer can be of a different material and its thicknesses can be defined separately for container side and bottom(s). Above the illustration you can find a “Preview” combo box. You can use it to see the scaled preview, instead of generic illustration. The image is proportional, which is aims to assist in identifying any obvious mistakes made in entering the parameters, which would otherwise be hard to detect. You can zoom-in and zoom-out the preview image, pan it and export it to various raster and vector graphics formats (read more in the Data entry section). To be able to see the preview image, all dimensions must be entered. Otherwise, no preview can be generated.